Teachers are pyro technicians. At least, that is if William Butler Yeats is to be believed. In his true symbolist form, Yeats reminded us that, “Education is not the filling of a pail, but the lighting of a fire.” While this belief fuels much passion for education, it also highlights the paradoxical role teachers play in modern education as both firebug and firefighter. 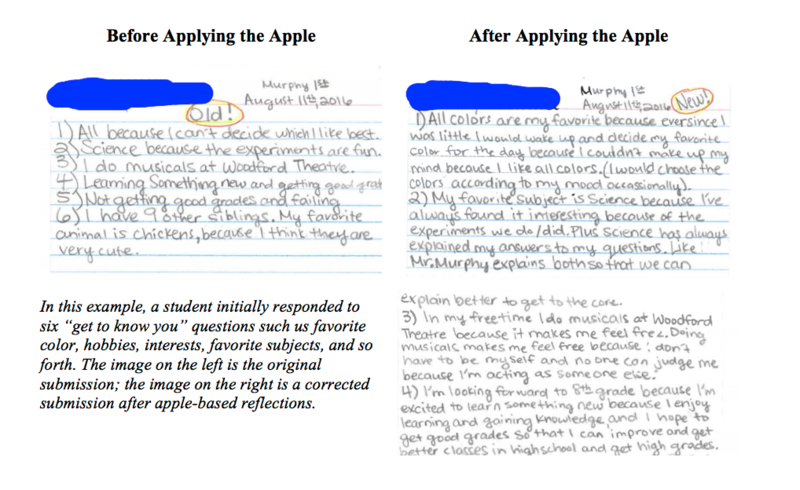 To better balance these dueling roles, I’ve adapted a variety of research on visible thinking and learning into a straightforward “Apple Framework” as a tool for monitoring learning and thinking in our classroom. The slicing and dicing of education into grade levels, disciplines, and different buildings often presents us with a disjointed framework within which to teach and hone enduring skills--skills that know no boundary between disciplines or among grade levels. These include critical and complex thinking skills, analysis, considering different points of view, reasoning with evidence, and drawing conclusions. These are worthy fires but they are often snuffed out just as the embers are starting to glow. What if teachers engaged in an intentional, concerted effort to build upon the sparks of creativity we generate every day in the classroom? Imagine the potential if the sparks we see as early as kindergarten and the elementary years are kindled, billowed, and fueled throughout a child’s schooling career. This is, perhaps, what John Hattie was thinking when he reminded us that “visible learning and teaching occurs when there is deliberate practice aimed” at producing learning outcomes. This deliberate practice requires us to be just that--deliberate. This means ensuring what Hattie calls the “act of learning” is not only uninterrupted but also strengthened throughout a child’s schooling. At first glance, this degree of vertical alignment may seem like a daunting task within a school--let alone a district. This is especially compounded by the slicing and dicing of schools into grade levels and departments. Arbitrarily established fences and artificial boundaries make it difficult to think about an open landscape of learning. The education lexicon has for years discussed concepts such as Bloom’s Taxonomy, Depth of Knowledge, Hess’ Matrix, and so forth to help guide teacher questioning and instructional design. But much of this attention is teacher and question-centered rather than student and answer-oriented. To begin to expand and shift this landscape, it is important to think about the skill that every teacher needs to teach and which are most enduring to a child’s schooling--critical thinking. And this requires not just holding our questions to high standards, but also our students’ answers. In Hattie’s Barometer of Influence, moving into his “Zone of Desired Effects” requires a combined effort on both the part of the teacher and the student. And, as a teacher, we must equip students to maximize their learning in all classes since the fuel to move into this zone is fundamentally uniform. This is where the Apple Framework plays an important role; it is a way to not only visualize the “act of learning” but also make us more intentional about it. I’ve embedded it fully in my classroom such that it is a common language about what I expect of students, what they can expect in my scoring and assessment, and what they should expect of themselves. It is a way to map understanding, a means of assessment, and a communication device lumped into one. A model like this could be even more powerful if it was taught early and followed a child through their schooling career. In fact, just weeks into the school year, a colleague told me that when she told a student his written response was not sufficient, she said the student responded, “Oh, so you want a Mr. Murphy answer?” But there is no reason these expectations cannot be the answer expected in each class, not associated with a teacher. And this anecdote is also a reminder that most of us already expect such work from our students, but we just aren’t as overt about those expectations. Simply stated, the Apple Framework walks students through the thinking process using the metaphor of an apple. At the skin level, they are describing what they see and notice. As they get under the skin, they start to see more details. Moving into the “substance” of the apple, students begin to build explanations, make connections, and consider other points of view. At the core, this unfolding thinking should empower them to draw conclusions and make even deeper connections. And, of course, throughout the framework they are reasoning with evidence. The structure is not revolutionary and is perhaps simply a new edifice for an existing framework. But the difference it has made in my classroom isn’t just talking about it but making it a core (pun intended) component of my classroom. In implementing this model, I also employed standards based scoring such that student grades were aligned with positioning students on the Apple. Now, they knew that a “2,” for example, didn’t mean some obscure concept such as, “You’ve almost got it!” Instead, this communicated that perhaps they were, “Getting under the skin” of the concept but needed to dig deeper to build explanations. To expose students to the framework at the beginning of school, I ask them to apply the ideas of the framework to the traditional “Tell Me About Yourself” activities of the first days of school. Students fill out index cards about themselves--thus removing the additional pressure of learning new content when learning a new thinking strategy. We then use these responses to move our answers deeper to the core (see example below). When a student told me their favorite color was blue, for example, I asked them to consider why they thought blue was their favorite color. This may seem absurd on the surface, but as students approach their subject, they are compelled to think about how the color makes them feel, what associations it has with past experiences, etc. Perhaps the student has fond memories of visiting their grandmother when they were younger and they realize their grandmother’s house was decorated primarily in blue. Making those types of thinking connections is powerful for students. It’s a model of how they should approach their thinking on any content we explore--recognizing this process makes it easy for a student to transition from talking about their favorite color to talking about the road to the Revolutionary War, for example. Students readily recognize the value of the framework, as much as they may publicly bemoan the requirement to expand their thinking and challenge their boundaries. This is a frequent theme that I’ve seen in student evaluation surveys. One student replied, “Mr. Murphy challenges us to do our best and he explains our learning clearly and he makes sure we understand,” and another described the framework as a process of being “trained to think to the core.” Essentially, should we not make equipping--or “training” --a student with the skills to think critically a goal of schooling? As students share their reflections, many revealed that these skills transferred to their other classes--as we saw in the “Mr. Murphy answer” example above. This emphasis transforms grading from monologue to dialogue. It empowers the students to assess their own learning, reflect, revise, and set goals (as we do at each stage of the learning process). And it equips the teacher with a meaningful measure of learning and thinking in their classroom that can truly guide instructional outcomes. You can learn more about the framework, see work samples, and learn how to use it in your classroom at http://mrmurphyapple.wordpress.com. What an even more powerful tool it would be if this was a model that every teacher didn’t have to teach anew or individually; if this mindset and approach became as normal to school as putting your name on paper. Such thinking is, needless to say, the core of learning. Tyler Murphy teaches Advanced 8th Grade Social Studies at Woodford County Middle School in Versailles, KY. Mr. Murphy is passionate about education and his content, emphasizing the various perspectives that give shape to our history both past and present. At Woodford County, Mr. Murphy serves as an Academic Team Coach, a member-elect of the school's SBDM council, and Y-Club sponsor. Mr. Murphy serves on the Kentucky Education Association's Central District Board of Directors and works with the Kentucky Governor's Scholars Program, where he serves on the Statewide Selection Committee and spends the summer as Assistant Campus Director at the Morehead campus.